The city of Pinton has never been safe–and now a serial killer is on the loose. Doctor Alice Reive is the city’s coroner, and she’s determined to help find the murderer. Enlisting the assistance of the Honorable Dante Kipling and city guard Elle Brown, they race to track down the killer, before another victim dies. Hannah Romanov–Dante’s missing twin sister–has spent hundreds of years living on an isolated mountain. But her quiet life is thrown into chaos after she discovers a baby left in the wilds to die. Hannah will do anything to ensure the infant’s survival, even if it means travelling to the worst place in the world for her: Pinton. 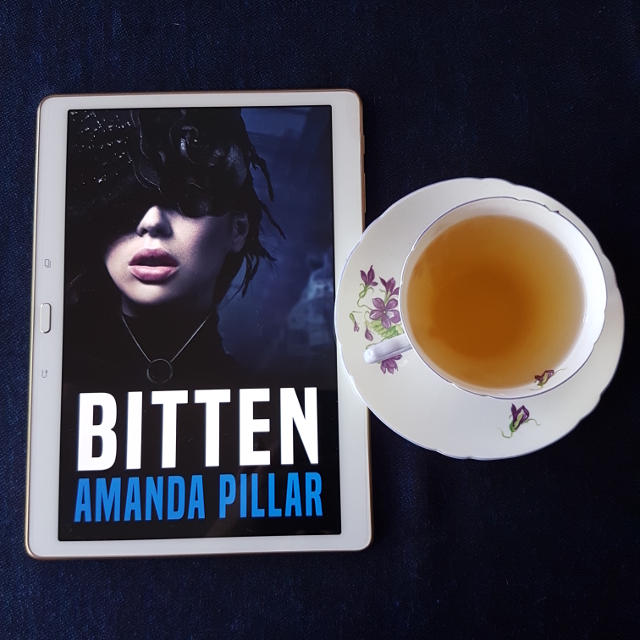 Bitten is a new novel in Amanda Pillar’s Graced universe. It features some returning characters, but the focus is mostly on new characters or incidental characters from the previous novel. As such, it stands alone reasonably well and should be accessible to new readers. There were so many potential ships in this novel. The blurb had me half expecting a f/f romance. However, it soon became clear this was unlikely. Like Graced, this was a novel that kept me on my toes; readers going into it expecting a pure paranormal romance are likely to be disappointed. The pairings happen quite a way into the story, with one getting started almost at the end. Instead, romance is balanced out with a hefty dose of crime and fantasy road trip. The development of non-romantic relationships make it equally satisfying. I enjoyed seeing the strong friendship between two of the main male characters and to learn a bit more of how that came to be. There were also some great family dynamics, especially within Hannah’s family. And I appreciated that we got to spend some time with characters from Graced and to see how their adopted family dynamic is developing. The story does make use of the fated mate trope, which is one I really don’t get along with. However, I was really impressed with how the trope was handled. It makes it clear the attraction the characters feel is instinctual lust and that it’s just one step along the path, with the next being getting to know each other better. Diversity was a key part of Graced and remains strong in Bitten. The characters have a wide variety of skin tones. Hannah has something akin to a touch phobia and Alice has some mild OCD tendencies. I wasn’t wholly sold on the latter, but I have no experience with it, so your mileage may vary. I found the ending of the crime plot a little weak but it’s difficult to say more on this without spoilers. However, I can say that the characters and world-building make it well worth the read. The novel also finishes with a revelation that will have some very interesting implications for the world and I’m really looking forward to finding out what happens next. I too am not all that big on the “fated mate” trope — I miss out just about every soulmate fic or romance novel I ever have the opportunity to read. But I trust you! I will give it a try! Argh, now I feel the weight of living up to your expectations. I do hope you enjoy Bitten as much as I did. Also, if you ever come across that story, please let me know! Because I think it would be a fascinating read, if uncomfortable.